Crinoid remains are extremely rare in the Late Cretaceous fossil record of California. A friend recently donated a stalked crinoid-stem fossil collected from Upper Cretaceous rocks in the Santa Ana Mountains, Orange County, Southern California. I have seen many fossils from these rocks but never a crinoid. Its geologic age is Turonian (about 90 million years old). The genus of this fossil is unknown. This specimen is 8 cm long and 3 mm wide. 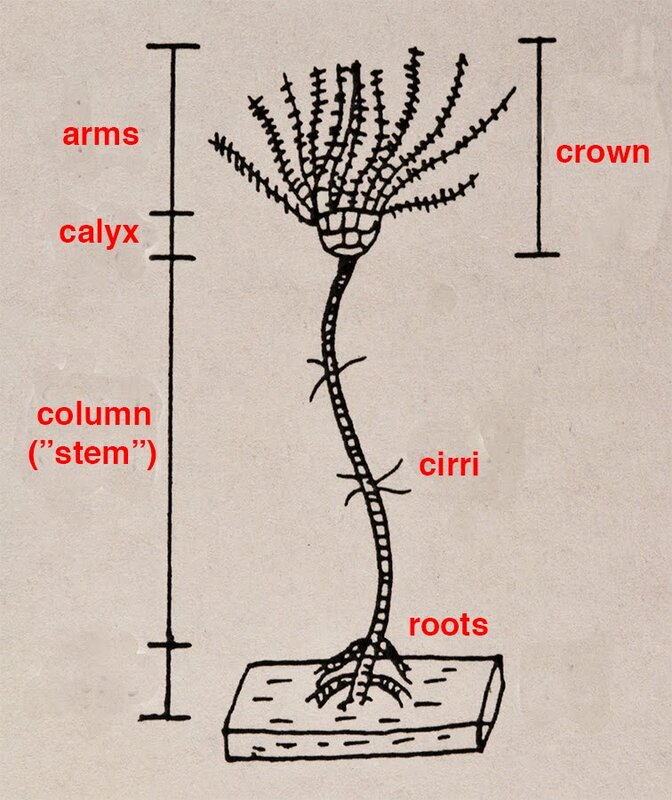 I also put a modern-day crinoid "stem" (from Cuba) alongside, for comparison; it is 6.5 cm long and nearly 3 mm wide. You can definitely see that the fossil is, indeed, a crinoid. Crinoids are echinoderms. Some other examples are sea stars (starfish), brittle stars, sea urchins, and sand dollars. Crinoids were very common in Paleozoic faunas, and their remains have contributed substantially to Paleozoic limestones. Crinoids today are less abundant than they once were, but at the present time there are approximately 25 stalked genera (all attached to the ocean floor and restricted to depths greater than 100 m). There are also about 90 or so unstalked genera, and these are able to swim about when they are adults. 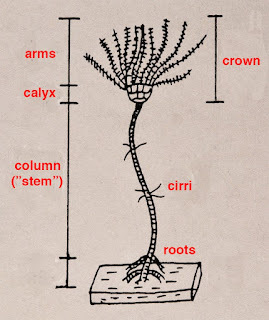 This drawing shows the main morphologic parts of a stalked crinoid (i.e., having a column or "stem"). The "stem" was originally somewhat flexible during life and could sway slightly with the prevailing water currents. Both the fossil and modern-day columns shown above in the photo are missing their calyx (where the stomach was located) and their arms.